The benefits of aromatherapy: although the contemporary practice of modern aromatherapy originated within the last hundred years, the use of essential oils to heal mind, body and spirit can be traced back to all the major ancient civilizations of the world. Aromatic plants played a central role in the healing arts of early humankind. Back in the modern world, a renewed interest in natural, plant-based healing or prevention of diseases led to the development of modern aromatherapy. There are many different benefits of aromatherapy that help people find health and well-being. The most important are the completely natural qualities of aromatherapy, the emphasis on preventive measures and on clients learning to take responsibilities for their own health care. 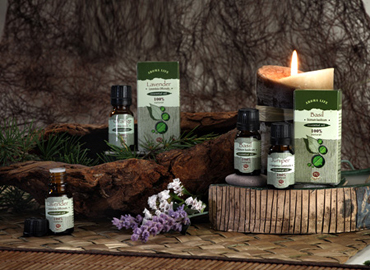 Essential oils are a precious gift from Nature, derived with minimal human intervention. The vegetable base oils, used to dilute essential oils before massage are also natural. Both the base and essential oils work in harmony with the human body, minimizing any risk of adverse reactions. Aromatherapy’s natural qualities help to redress the problems caused by excessive use of many chemicals and synthetics, typical for the modern world. The essential oils are very concentrated, volatile aromatic mixtures, derived though distillation or cold pressing of plants’ blossoms, leaves, fruits, seed and roots. They contain biologically active substances, resembling hormones, vitamins, antibiotics and antiseptics. Introduced into the organism through the respiratory system or the skin, the natural essential oils act like catalysers of biochemical processes there thus contributing for health preservation, strengthening and restoration. Taken in through the olfactory system the plant aromas have a quick and effective therapeutic influence, activating the analyzers of the central nervous system, influencing the respiratory, cardiovascular and other systems of the organism. Taken in through the skin, the phyto-organic compounds get into the blood and lymph, exercising a therapeutic influence on a number of significant vital functions – metabolic, secretory, endocrinic, immunobiological. The most valuable use of essential oils lies in professional aromatherapy massage treatments, resulting in improvement of skin’s biological functions, stimulation of blood circulation and body metabolism. But you may also happily enjoy the use of essential oils at home. Perhaps the most common way is by adding a few drops to a bath: the aroma baths are water procedures providing healing, health prevention and beauty. Dip the whole body, but without the head, neck and the upper part of the breast. Other home uses of essential oils include steam inhalation, hot and cold compresses, blending them into face creams and body lotions, using them in hair care and as room fragrance and for air disinfection. Safety Considerations: Never take essential oils orally. Avoid contacts between essential oils and the delicate mouth or eye areas. Each organism manifests different sensitivity towards the different essential oils! A sensitivity test is obligatory: In case of olfactory acceptance wait for several minutes for appearance of side effects. Apply only properly diluted essential oils to the skin and follow the recipes and methods carefully. In cases of taking in the essential oils through the skin make a sensitivity test through rubbing in of several drops of the massage mixture on the inner side of the cubit part of the arm and wait for 4 – 6 hours for the reaction of the organism. If you accidentally splash a drop of essential oil in your eyes, use a small amount of base oil to dilute the essential oil and absorb it with a soft cloth before rinsing your eyes with cold water. If there is a serious incident, seek medical attention. A few essential oils, such as bergamot and other citrus oils are phototoxic, so avoid using them on sun-exposed skin. Essential oils are flammable. Keep them out of the way of fire hazards. Use: Aroma lamp – 1 to 5 drops; Bath – 10 to 15 drops; Massage – 1 to 5 drops in 20 ml of carrier plant oil; Like an additive to cosmetic products – not more than 0.005%. Storage: Highly-concentrated product! Keep the bottle well-closed and out of reach of children at t º 7º-25º C.
Attention: The information provided here is with cognitive characteristics. In case of using aromatherapy for healing purposes, please seek a profound knowledge in specialized literature and consult a doctor or aroma therapist.